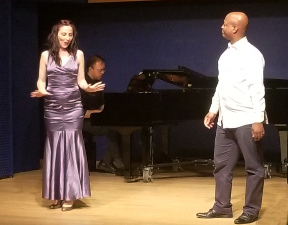 L-R: Soprano Eilin O'Dea, musical director Brian Holman, Tenor Byron Singleton. Photo by Eseosa Ajala. Soprano Eilin O'Dea and tenor Bryon Singleton, accompanied by pianist Brian Holman, certainly did not take an easy route in their concert "A Night at the Opera." They chose virtuoso arias from Puccini's Madama Butterfly, including the Love Duet from Act I, Butterfly's famous Un Bel di aria, and her suicide at the end. From Verdi's Aida, Singleton performed "Ritorna Vincitor," and the couple sang the love duet while enclosed in the tomb. Puccini was again represented with arias from "Tosca," - "Mario! Mario! Mario!" from Act I, Tosca's "Vissi d'arte," "Elucevan le Stella" for the tenor, and the final scene with the shooting of Cavaradossi. They were wonderfully accompanied by pianist Brian Holman, who played beautifully and showed great sensitivity to the performers' needs. It was an extremely ambitious program of wonderful music. Ms. O'Dea's performance was uneven throughout the evening, though she seemed to warm up as the night went on. She produced some impressive high notes and charming acting, especially in Act I of "Tosca" when she visits Cavaradossi in church. I was bothered throughout the evening, however, by her Italian, which seemed very learnt and unnatural for her.